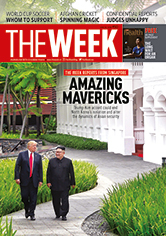 The Singapore summit between the predictably unpredictable Donald Trump and the reticent and ruthless Kim Jong-un was a momentous moment in international diplomacy that may reset the power equations of the world, provided both the parties remain earnest enough to walk the talk (‘Little Rocket, Big Launch’, June 24). The proof of the pudding, as they say, is in the eating. To prognosticate at this juncture on whether Trump and Kim are eligible for Nobel Peace Prize is like counting the chickens before they hatch. The Trump-Kim accord was interesting. The US no longer believes in playing the role of a universal policeman, like earlier, with countries like Vietnam, Iraq and Libya. One hopes that these developments in the long run will result in freedom of expression, and productive social interaction for the North Koreans. With China’s continuous support to Kim, it will be interesting to see how serious he is on denuclearisation. In the past, the US administration, under Bill Clinton, had dealt with North Korea, only to be taken for a ride later. The US will have to be very cautious when it comes to dealing with a dictator like Kim, who, with China’s solid support, will not mind going back on the accord. Your Letter from the Editor is a phantasmagoric kaleidoscope of every conceivable subject under the sun. Dipping into his vast repertoire of experiences, Philip Mathew successfully introduces the reader to a bewildering range of men, matters and memories, reminiscent of the style of the late Frank Moraes. Truly, this is journalism with a human touch. I look forward to Mathew’s letters and feel very disappointed when he does not write. Judging the judges is a risky exercise (‘Appraisal uprising’, June 24). As a rule, they are hypersensitive to any probe. The method of appraisal of performance of the subordinate judicial officers may be punctiliously codified, but the lapses and lacunae in the exercise of discretion, and the inherent flaws of human nature, generating bias and prejudice, cannot be eradicated. Judges are angels, but in governmental organisations their performances are usually judged by extraneous considerations. Impartiality and fair play percolate from the top. Who will bell the cat? Politics in India has become dirty and ruthless. And, no one understands it better than Baijayant Panda (‘This week, meet’, June 24). One of the founding members of the BJD, Panda was very close to Naveen Patnaik. The question is whether Panda can challenge Patnaik to emerge as the chief ministerial candidate in 2019. Though such speculation, at this stage, could be somewhat premature, Panda may well be the game-changer that the BJP is looking for in Odisha. Pratul Sharma’s report clearly explains the pros and cons of hiring specialists from the private sector to secretarial posts (‘Trial by hire’, June 24). Specialists who will come into the government will come with a baggage. Unlike regular officers of the Union government, these specialists cannot be placed under any obligation when they “retire”, after mere five years in service, on taking up employment in other positions. There have been sufficient examples in the past of some government officials using their influence to help certain organisations while in service, and on retirement joining the same organisation. How the government of India will solve this riddle remains to be seen. I am not sure if lateral entry to secretarial posts will bring in more expertise. These people, once they are selected, join in the rank of a joint secretary. But, they have to report to the IAS officers who are at the helm of affairs in the respective ministries. So, it is upto the IAS officers to take the fresh and vibrant ideas of these lateral entry officers and present them in front of the ministers. Also, at the end of the day, such appointments have to be permanent. There is no point if talented people from the private sector are taken into the government for a short period. Donald Trump’s unpredictable behaviour is quite scary; America is the world’s most powerful nation and it is not good if the president of that country is full of ups and downs (‘A new world disorder’, June 24). Republican leaders in the US should advise Trump not to behave in this manner. He should be careful about what he utters at international summits. Trump should respect leaders from all countries. He should learn to agree to disagree. I eagerly look forward to Sanjay Manjrekar’s column for its simplicity (‘Last word’, June 24). I admire his simple English. Not everyone can attempt to write like the way he does. It is an art that he has mastered, but unfortunately he could not master the art of batting, for unknown reasons. Manjrekar should continue to entertain us with his columns, unlike a few biased columnists in your magazine. Every week, on the cover page of THE WEEK, the issue date is printed in black on red coloured background, which makes it very difficult for me to understand in the first look. I think the colour combination is not right. For better visibility and understanding, it should be black on white, yellow or blue coloured background.